Medical Waste Regulations: Who Creates Them and Who Enforces Them? Also referred to as biohazardous waste or as infectious medical waste, regulated medical waste (RMW) is any type of waste that is potentially contaminated by blood, body fluids or other materials that may cause infection. There are several different categories of waste that may be regulated, with each of these categories requiring special handling. How are these regulations determined and how can medical waste containers help to ensure you are in compliance? In the past, the Environmental Protection Agency (EPA) played a central role in determining how medical waste needed to be handled. Today, the EPA no longer plays such a significant role in the process. Instead, these regulations are handled largely by each state with other federal agencies handling some of the responsibility. Many people are surprised to learn that Federal law does not explicitly define medical waste. Nearly each of the 50 state, however, has enacted medical waste regulations. While some of these regulations are based on the Medical Waste Tracking Act, which was established in the 1980s by the EPA and identified which types of waste were to be regulated, other state laws bear no resemblance to this old law. While the state’s environmental protection agency may play a key role in the regulating of medical waste, other states place the responsibility primarily on the department of health. In other states, both departments play a key part, with the health department focusing primarily on on-site management and the environmental agency being responsible for the transportation and disposal of the waste. What are Some Common Procedures for Removal of Medical Waste? Most state laws require RMW to be rendered non-infectious before it can be fully disposed of. Most also have regulations regarding how the waste is to be packaged, stored and transported. In some states, health care facilities are required to register or to obtain a permit for the waste. Yet others require facilities to develop contingency plans and on-site treatment plans, while others have strict guidelines related to training, recordkeeping, reporting and tracking the waste. In addition to the potential involvement of a state health department and environmental agency, the U.S. Department of Labor Occupational Safety & Health Administration plays a role in monitoring facilities to ensure they are in compliance with all health regulations. Some states also have their own OSHA programs that may be involved with this process. 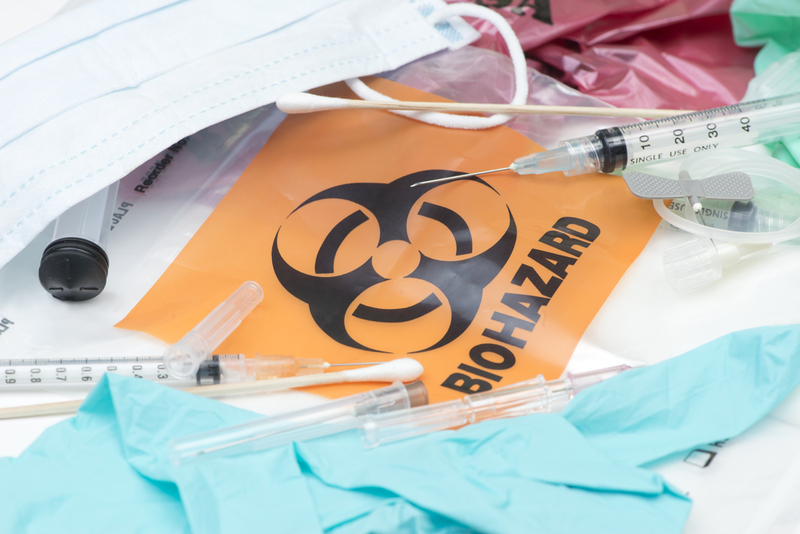 In states with comprehensive medical waste regulations, there is sometimes an overlap between the state regulations and the OSHA bloodborne pathogens standard. There typically are not conflicts between these regulations, but there are times where one set of rules may be vague while the other is highly specific. In these cases, healthcare facilities follow the more detailed regulations. Securr is pleased to offer a number of medical waste containers that meet the regulations established by both state and federal regulatory commissions. Whether in need of a kiosk for sharps or other medical waste, we have both indoor and outdoor varieties available.